The US Postal Service has been around for over 170 years. As media has evolved, the art on stamps once coveted by collectors is now less visible than ever. In a world where stamps are often viewed simply as a commodity, we needed to find a way to showcase the art, and to do so in a way that resonated with modern audiences. Working with Powers Media and DigitalHistoryStudios, we set about creating a virtual stamp gallery where users could not only view the art, but get a closer look at the subject as well. Using newly released stamps as our featured art, we created five custom animated experiences that were triggered by users gazing at the artwork. Upon activation, users were teleported into the scene depicted on the stamp selected, immersing them in a world totally unlike their own. No project comes without obstacles, and this was no exception. In just under a month, we took the project from idea to execution, working to create an experience with consistent art direction, smooth transitions, all while using the HTC Vive as our main platform. Because a large portion of our audience was 50+, we knew that the core functions of the platform needed to shine. We tested several different transitions before ultimately settling on a crossfade between scenes, and tweaked the timing of the transition to be comfortable to the viewer. Feedback to the user when viewing hotspots was crucial. Each interactive stamp enlarged when the user's gaze fell upon it, along with a circle that showed a loading bar around it to signal that it was an interactive component. The Virtual Stamp Gallery was a smash hit at a national postal event in Richmond, VA, boasting the most visited booth at the show. 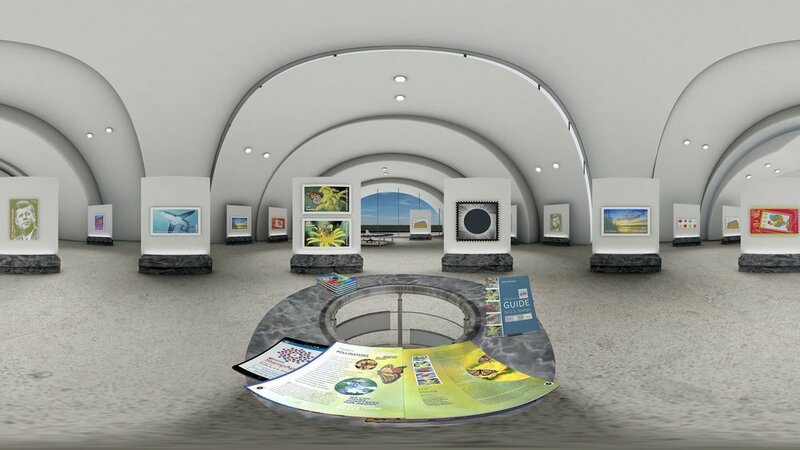 With a wide audience ranging from children and teens to people over 80 years old, the Virtual Stamp Gallery successfully transported people from the show floor into a world filled with new experiences and art. Since the original unveiling, the Virtual Stamp Gallery experience has been staged for the Postmaster General, the Executive Leadership Team and for a special VIP event at the Smithsonian.